Proceedings 2012 | International Association of World Heritage Professionals e.V. The proceedings of the international symposium “Understanding Each Other’s Heritage – Challenges for Heritage Communication in a Globalized World” can be purchased at the link you find below. 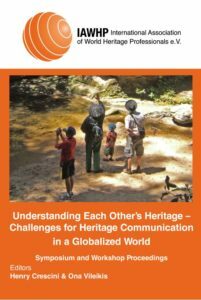 Understanding Each Other’s Heritage – Challenges for Heritage Communication in a Globalized World, Symposium and Workshop Proceedings. Cottbus, Germany – July 19 -21, 2012.